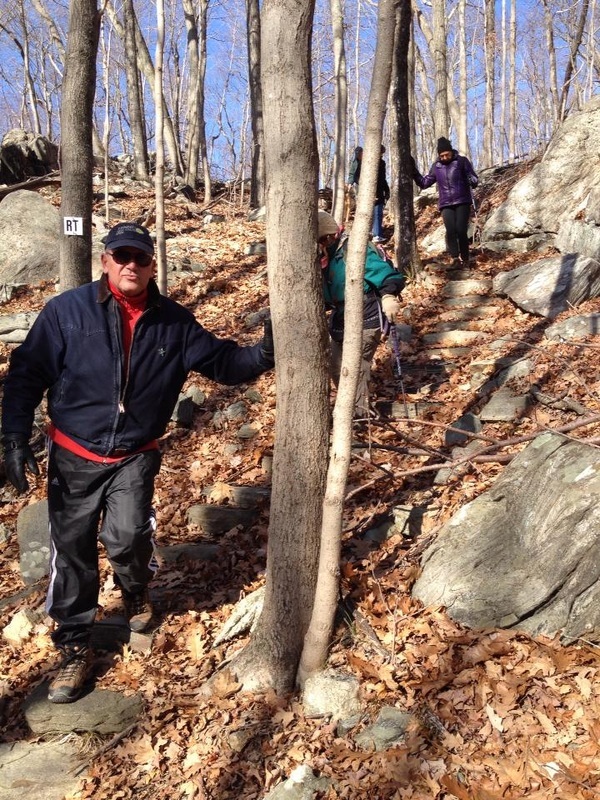 Nov 30 (Sat) 2013 10:30 am: Thanksgiving weekend hike! 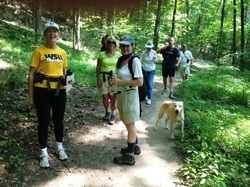 Thanks to our fearless hikers (and leader, Bonnie Robins!) 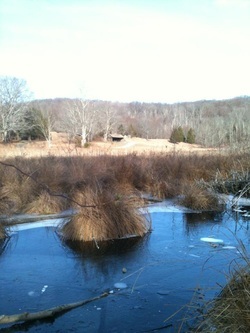 who braved the chilly temperature and enjoyed a rugged six mile hike in the beautiful sunshine, at Ward Pound Ridge Reservation. Nov. 9 (Sat) 10:30: "Fall Foliage in the Reservation"
A brisk 4-mile, 2-hr hike on the Blue Trail at Pound Ridge Reservation, led by Bonnie Robins. Rated moderate with some challenging terrain. Please wear sturdy footwear. Followed by a picnic (optional) at Kimberly Bridge in the reservation. Meet either at Yellow Monkey Village at 10:15 for car pooling or at Kimberly Bridge parking area at 10:30 (Note entry fee applies for cars). Look for signs. Rain date: Sunday, Nov 10. Oct 12 (Sat) 10:30: Family Hike "Birds and their Migratory Habits"
Mt. Holly Preserve. 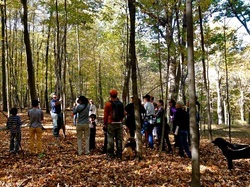 Over 30 people of all ages joined Naturalist Jim Nordgren for a 1-1/2 hour guided hike at Mount Holly Preserve. Forty-five hikers joined us for a walk of the Leon Levy Preserve on Sunday, September 15th. It was led by Jim Nordren, with assistance from Paul Lewis and George Scott. And we were joined by Shelby White, who donated the funds to preserve the property, in honor of her late husband Leon Levy. Sunday, September 15th, we hosted a very successful Nature Photography Workshop at Mountain Lakes Preserve as a partnership with North Salem Open Land Foundation. 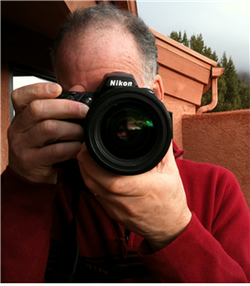 Twenty-six participants joined instructor Rich Pomerantz for a three-and-a-half-hour workshop on the guidelines for outdoor photography, followed by a critique of the participants work. July 20: (Sat) 10:30: Hike & picnic: "Exploring Pound Ridge Reservation" Lewisboro Town Park to Deer Hollow Loop. Join us for a 1 1/2 hr moderately paced hike guided by Peggy Nordgren, followed by a BYO picnic in the Town Park and a short discussion of "Leave no Trace" outdoor recreation guidelines. Meet in upper parking lot above the ball field in the Lewisboro Town Park on Route 35. Rain date: Sun July 21 at noon. Leashed dogs welcome. Mt. Lakes Camp (on the border of Lewisboro and North Salem). Naturalist Jim Nordgren discussed naturalizing your garden with native botanicals on this 1 1/2 hr. hike rated moderate. 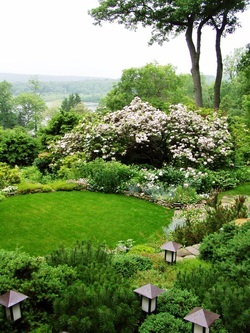 Lewisboro Land Trust & Lewisboro Garden Club invite you to explore 6 unique gardens in Vista, Pound Ridge & South Salem. Picnic lunches available. shrubs are about to bloom, the Skunk Cabbage is flowering, and the Red-winged Blackbirds are back! Looks like we made it through another winter.